Sound the alarm and dispatch the emergency personnel because this winter is not playing around with my skin. The main culprit for me though is dehydration. I still get shiny in my t-zone no matter how cold or hot it is outside but I can often tell my skin is dehydrated just by how it feels and looks - dull and lackluster. Lack of moisture is not just for those with dry skin - if I had to guess I would say that most people are quite dehydrated just from how we live our lives. 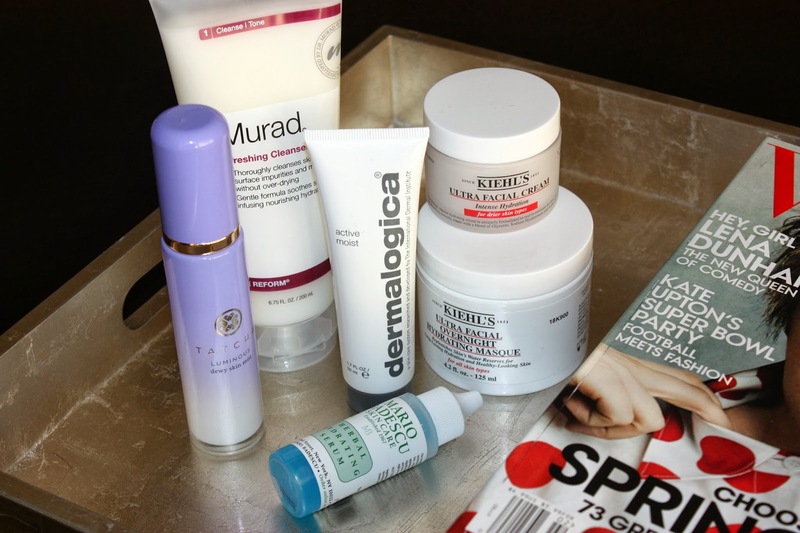 Adding hydrating products into my routine is always my first priority, even over anti-aging products. Mainly because I find that keeping my skin full of moisture and water is the best anti-aging remedy out there (in my opinion of course, but it's my blog so my word goes. *stomps feet, pouts lips*) I have quite a strong arsenal of products helping me fight the dehydration battle, from masks, to serums, to sprays, to cleansers and beyond. Click on each product for more information. 1. Tatcha Luminous Dewy Skin Mist - Not a first time appearance on the blog, this Tatcha mist is a must have at home, on the go, or anywhere you may need a burst of hydration. My favorite part of this is how evenly it sprays, leaving the skin subtly hydrated rather than drenched. It has a milky texture, so the soothing sensation it leaves is quite addictive. As I have said before, it is a bit of a splurge, but I feel so worth it. 2. Murad Refreshing Cleanser (c/o) - While I leave it up to my cleansing oils to remove most of my heavy duty makeup, I have been following it with this Murad cleanser. If you read my recent "How I Take Care Of My Skin" post, you know that I typically cleanse twice each night. I fell instantly in love with this cleanser because it is both a foaming cleanser with a rich milky texture - AKA the best of both worlds. I find it leaves me feeling clean, refreshed and nourished without any dryness or tightening which can be a feat in and of itself for a cleanser. 3. Dermalogica Active Moist (c/o) - If there is a skin issue, Dermalogica has a product designed to address it. I find that while some lines are great for helping me treat certain issues, Dermalogica literally has a product for every ailment my skin may face. I discovered this product on a whim when it was sent over with a few other products, and sadly I placed in the back of my beauty shelf only to forget about it for a few weeks. When I dug back there one day and discovered it again, I slapped it on and was promptly speechless. It is oil-free so it doesn't feel heavy on the skin, but it is like a drink of water for my face. Hydration is immediate and whether I wear day or night, my skin never gets oily after. Dermalogica wins again - hydration success! 4. Mario Badescu Herbal Hydrating Serum - Again, another product not new to my blog but one that needs to be mentioned over and over and over - and especially now that we are talking hydration. Upon first feeling the texture of this serum, I was hesitant because of it's slightly honey-like feel rather than a typical water-like serum. Then I applied it. Welp, I was hooked. It is the number one product I reach for when my skin is irritated, sensitive, worn out, been dragged through the mud, etc - because it helps to soothe absolutely any problem I have and balance my skin again. 5. Kiehl's Ultra Facial Cream Intense Hydration (c/o) - With a name like that, it's as if it was written for this post, yes? Kiehl's has been a brand that I have used for years because of their simple but efficacious formulations, and as a long time user and lover of the Ultra Facial line, this new addition couldn't have come at a better time this winter. While so many products help me to keep hydrated, I still suffer occasionally from those stubborn dry patches that come because mother nature is hell bent on making me suffer for not recycling enough or something. I use it on those specific patches and have found it to be a miracle worker - stubborn dryness no more. 6. Kiehl's Ultra Facial Overnight Hydrating Masque (c/o) - I mask nightly as we learned from this post. So in addition to the new Ultra Facial Cream Intense, I am using this Kiehl's Ultra Facial Overnight hydrating mask once a week. I often fear overnight masks due to the high mess potential, but since only a very thin layer is needed I find that I can manage it quite well. It still gets on my pillow case slightly, but barely enough to notice and certainly not enough to persuade me not to keep using! However, what is noticeable and extremely persuasive is my face the next morning - hello soft, supple, moisturized and calm skin. Another winner in my book and again the reason why Kiehl's products will forever be in my routine.